1. Casual Shoes: For almost all everyday occasions, oxfords, loafers, low-heel pumps and moccasins are most common. 2. Dress Shoes: Usually worn for special occasions. 3. Athletic Shoes: A wide variety exists for specific sports. 4. Work Shoes: Worn for safety, function and comfort. 5. Corrective Shoes: Designed to accommodate structural foot abnormalities in a child, adult or the elderly. UPPER: Outer layer of shoe material, often leather or canvas. TOE BOX: Area surrounding the toes. VAMP: This cradles the area where the toes are connected to the foot, called the metatarsals. COUNTER: Stiff material on either side of the heel. LAST: Shape of the shoe. Modern day footwear has become a fashion statement with protection, comfort, function and hygiene dropping in priority. When shopping for shoes, podiatric surgeons recommend that consumers follow the advice of the American College of Foot and Ankle Surgeons: FIT: Shoes should fit snugly in the heel and provide ample room in the toe area. 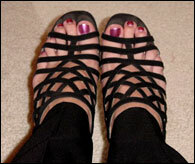 Shoes should not cause redness or irritation to any part of the foot. SHAPE: Pointed toe shoes should accommodate for narrowing of the toe box. MATERIALS: For maximum comfort, look for breathable, lightweight materials that are strong yet supple. Best bets are leather and cotton canvas. Vinyl does not let the foot breathe. TREAD: Shoe soles should be chosen for how they interact with the surface on which they will come in contact. CUSHION: Shoes constructed with more cushioning will absorb more impact and better protect your feet. SHOE WEIGHT: Lighter shoes may seem more comfortable initially, but heavier shoes may provide more support. SPECIAL NEEDS: Extra-depth shoes or custom-shoes may be necessary to accommodate for structural foot deformities. Consult a podiatric surgeon who is a member of the American College of Foot and Ankle Surgeons. Purchase shoes are the end of the day, or after work or playing sports for best fit. 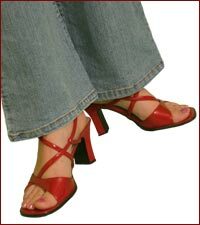 Earlier in the day your feet are at their smallest and you may purchase shoes which are too tight. Measure both feet. No two feet are the same size. Purchase shoes for the larger foot. Try on shoes with the socks or hose with which you will wear them. Don't rely on the shoe "stretching" to fit. Shoes should feel good when you try them on. Ensure the widest part of your foot fits comfortably, but securely, in the shoe. When possible, allow babies to go shoeless. Use shoes for protection and balance when the child starts to walk. Leave ample space between the child's longest toe and the front of the shoe. Ensure shoes are held snug against the heel without slippage. Toddlers rarely say their shoes don't fit, so look for irritation, blisters, uneven wear, excessive perspiration or pain. Wear an arch support to help support the extra weight feet will be carrying during pregnancy. Wear athletic or running shoes with a roomy toe box. Wear support stockings to minimize foot and ankle swelling. Wear cushioned, athletic, walking or casual shoes. Wear a good arch support to reduce pressure to the heel and ball of the foot. Examine feet daily to ensure good foot health. Have bi-annual examinations by a podiatric surgeon who is a member of the American College of Foot and Ankle Surgeons. People often have foot pain and believe there is nothing they can do about it. The fact is, a podiatric surgeon treats problems such as heel pain, arch pain, birth deformities, tumors, arthritic and diabetic foot deformities, ankle sprains and fractures, bunions and hammertoes, and other conditions.Your foot is a network of 26 bones, 29 joints, and many muscles. On average, you take several thousand steps every day. Each step and every sport in which you participate places great pressure on the foot and ankle. It is no wonder most people experience foot and ankle problems during their lifetime.